Find out when to use first aid on your pet bird and when to get your bird to your avian veterinarian with these tips. 1) Bleeding that cannot be stopped is a true medical emergency. Too much blood loss will weaken the bird and may lead to death. Apply direct pressure to the site of bleeding if at all possible and immediately transport to your veterinarian. 2) Minor bleeding such as that in a broken toenail can be controlled with styptic powder or cornstarch, but avoid packing this into wounds, feather follicles or mucus membranes because caking the area with these products may damage tissues and lead to an increased difficulty in treatment. 3) Blood in vomit or feces is never normal and indicates a need for an immediate veterinary visit to determine cause and treatment. 4) Burns are a common accident, especially with free-flighted birds. Cool the burned area with cool water and transport to your veterinarian. Do not apply any ointments or butter on burned areas. These lock in the heat and increase damage to tissues. Butter increases the risk of infection. 5) Collapse or balance difficulties. Staggering, walking in circles, lying on the cage floor, or a total inability to rise indicate severe weakness, shock or a possible neurological disease/injury. Tremor and rigidity are indications of possible seizure activity. A bird in this state needs to be placed in a warm, dark and quiet area and immediately transported to a veterinarian. 6) Ingestion of poisons. If possible, take a sample of the ingested product with you to your veterinarian. Bring along any labels from household chemicals that a bird may ingest. Your veterinarian may want to wash out the bird’s crop and administer activated charcoal to absorb the poison. 7) Ingestion of foreign objects. Early care will allow for an easier retrieval of the object while it is still located in the crop region. Waiting might allow the object to pass into the proventriculus or ventriculus or intestine where retrieval is difficult and dangerous. 8) Any deep puncture wound, especially one caused by a predator such as a dog, cat or ferret, requires immediate veterinary attention. Deep or gaping lacerations need to be treated immediately as well. Wounds to the eye, chest or abdomen should be attended to as soon as possible. Apply direct pressure to the wound to control bleeding and transport. Leg or wing fractures where bone is not exposed may be splinted prior to transport to aid in pain control and to prevent them from worsening. 9) Gasping for breath, severely labored breathing or raspy, noisy wheezing are symptoms requiring immediate veterinary attention. These birds may have a respiratory obstruction and time is of the essence. Your veterinarian may need to place an air sac tube. Avoid stress from handling and see your veterinarian immediately. 10) Straining without stopping. This can be an indication of egg binding or intestinal/cloacal disease. 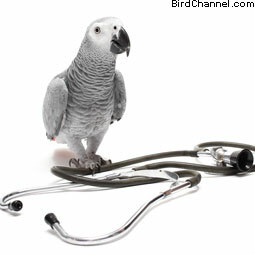 The bird should be placed in a warm and humid area while you seek advice from your veterinarian. 11) Uncontrollable itching. Itching that results in constant scratching, pecking at the skin and broken or bleeding skin may indicate an allergic reaction or exposure to some toxin on the skin. Bathe the bird to remove any skin or feather contaminants, and see your veterinarian for therapy. Anorexia (lack of appetite): Lack of appetite is a significant indication of illness if it is accompanied by depression or any other signs of illness. Difficulty in breathing: If there is a tail bob present or there is evidence of respirations that are more shallow and rapid than normal, veterinary advice is needed. A tail bob is a rhythmic up and down motion of the tail in the same pattern as the breathing. Swelling around the nares, or discharge from this area is an indication of respiratory disease that deserves attention. Eye problems: Partial to complete closure of the eyelids may indicate eye infection. A cornea that is cloudy or opaque to bluish-white in color may be an indication of a corneal ulcer or other corneal injury/infection. Treat eye problems as quickly as possible to allow for the best treatment outcome. Injury: Minor injuries that hold the possibility of becoming infected should receive possible antibiotic therapy. Severe diarrhea with or without vomiting or regurgitation. Liquid feces with a complete lack of form to them is an indication of diarrhea. Profuse diarrhea holds a risk of dehydration due to fluid losses. Vomiting may be noted as a foamy material with food particles on the cage floor. You may also see evidence of vomiting on the feathers of the head and face. Vomiting is generally accompanied by more violent head motions than are seen with regurgitation. Regurgitation is a more controlled motion. When either vomiting or regurgitation occurs along with profuse diarrhea, a yeast or bacterial infection may be present. Some toxins can cause these symptoms as well. Skin lesions: Raw areas of the skin, or areas of the skin with discharge indicate infection or trauma. Swelling of the skin can be associated with infection, feather cysts or skin tumors. Avoid the use of oil based ointments on the skin as these may interfere with body temperature regulation. Ointments also gum up the feathers and may lead to feather pulling in some birds. Anorexia without other signs or symptoms. Even healthy birds may have a day where they decide to skip a meal. This is usually secondary to stress or fear. Monitor the bird’s appetite closely and seek veterinary attention if the appetite does not return to normal within 24 hours. Mild diarrhea: Minor softening of the stool or one to two abnormal droppings may occur with food changes or stress. See a veterinarian if the droppings do not return to normal within 24 hours or if the diarrhea becomes severe. If evidence of abdominal pain or straining is present, this elevates the problem into the “call today” category. Mild itching: Mild itching and scratching with no damage to the skin may be monitored to see if the situation resolves on its own. Bathing is recommended to remove feather contaminants or to clear itching associated with dry skin. Excessive water intake: A large increase in the amount of water consumed may be due to diet. Excess water consumption occurring for more than 24 to 48 hours could indicate a metabolic disease such as renal disease or diabetes. A full veterinary examination with a blood chemistry profile is recommended to diagnose the underlying cause. Regurgitation alone: Regurgitation that occurs once or twice or that accompanies breeding behaviors may be normal for some birds. If regurgitation becomes frequent or persists, a veterinary check up is recommended to rule out crop infections. 1) Minimize handling of the ill bird as much as is possible. Excessive handling may overly stress the bird, aggravate shock and lead to death. 2) Delay treatment of any injuries that are not life threatening until the bird is out of shock. Deal with life-threatening emergencies as quickly as possible after they are observed. Cover a small cage with a towel and place the cage on a heating pad that is set on low. Infrared lamps can also be used, but place them slightly back from the cage to avoid overheating the bird. Make sure that no cords or parts of heating pads are within reach where they may be chewed by the bird.